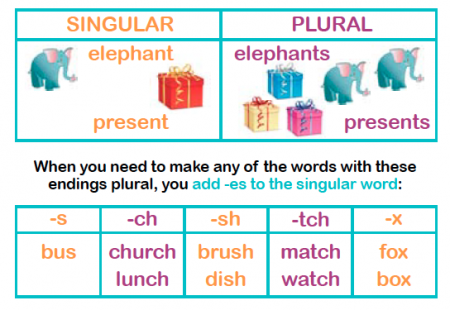 Get common nouns and concrete nouns clear in your mind and understand proper nouns and pronouns - our simple guide explains everything primary-school parents need to know about nouns and how to form the plural forms correctly. A noun is a naming word. It is a thing, a person, an animal or a place. A proper noun is the name of a person or place, such as Susan or America. Proper nouns start with a capital letter. A common noun describes a class of objects and does not have a capital letter, for example: car, animal or planet. A concrete noun is a person, place or object you can physically touch, such as: Dad, London or a table. Concrete nouns include proper nouns and common nouns. An abstract noun is a thing that cannot be touched or seen, such as education, love or success. 'Dog', 'balloon' and 'table' are nouns in the singular. This means there is only one of them. If these nouns were in the plural, it would mean there were more than one of them. An 's' would be added to the end to make the words 'dogs', 'balloons' and 'tables'. the word 'herd' is a collective noun to describe a group of animals. the word 'choir' is a collective noun to describe a group of singers. A pronoun is a word used to replace a noun. Examples of pronouns are: he, she, it, they. Possessive pronouns such as his, hers, their, your are used so that we don't have to keep repeating the noun. John put John's bag on John's peg. John walked to John's classroom. John put his bag on his peg. He walked to his classroom. In Key Stage 1, children learn that nouns representing people and places (proper nouns) are written with capital letters. They are also expected to start replacing their nouns with pronouns and use the plural form of nouns, simply by adding 's' to a word. Later on, they will move onto learning how to make words ending 'y', 'f' and 'fe' into plurals using the correct spelling patterns. They may also learn about collective nouns. In Year 2 they'll be forming nouns by using suffixes, and by Year 3 forming nouns using a variety of prefixes. From Year 4 they'll identify and learn to expand noun phrases.